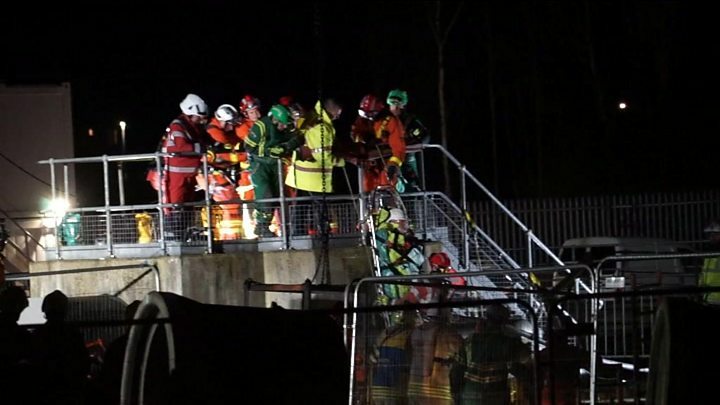 A rescue operation took place after a worker got stuck in a 20ft hole on a construction site. Phil Turnell, who was at the scene, said work was taking place to upgrade water and sewerage works. He said a machine had lifted the skip of concrete and was lowering it in the hole when it toppled. Mr Turnell said: "Two of the men were able to get out OK, but the third as he jumped out of the way (of the skip) landed awkwardly. "He couldn't feel his legs, but he was fine, he wasn't unconscious or bleeding. "They couldn't get him up the ladder on his own. It was a deep hole and they needed special rescue equipment." Welsh Water said the worker was one of its contractors. A spokeswoman added: "We will work with our contractor and the emergency services to fully investigate the cause of the incident."